My daughter and I had a quick brunch at Panera Bread as we were leaving her college to head home for the summer. It was yummy! Today is Mother's Day and because we had such a long tiring day and a very late night, I'm the only one awake. So with the taste of brunch lingering on my tongue, I started plotting! 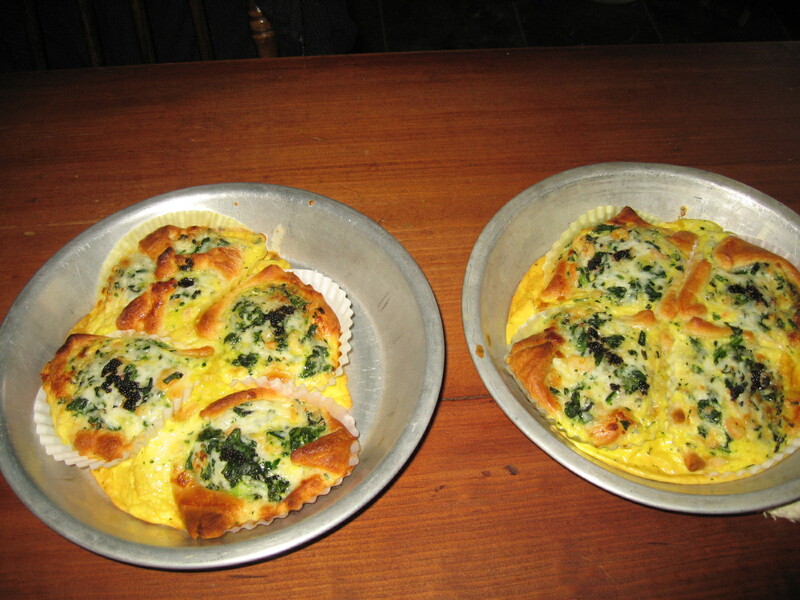 Yes, I have a tube of crescent rolls...eggs...cream...frozen spinach but no artichoke, hmmm...but I have wakame! Okay, shredded mozzarella. What goes with all that? A can of mini shrimp and a little left over caviar from a special occasion. Let's go! I thought I'd put some cupcake papers in a pie pan for a little base. Instead of putting them right in the cupcake pan, I wanted to give them more room to "breathe" without being too deep to bake in the time the pastry needed. Unfortunately, they wilted quickly. But it was too late to turn back. I placed 2 large tbsp of the mix in each cup and topped with a tiny clump of caviar. I baked them for 6 minutes, switched racks in the toaster oven and baked for 6 more minutes. 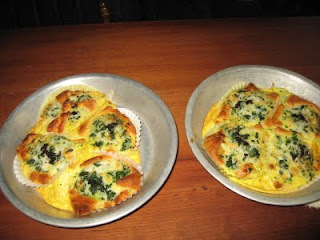 It might need a little more tweaking but they were pretty tasty and very well received! Next time, I'll try to find a better "form" to use and possibly a flakier type crust. Sounds very good, wakame, greek yogurt, spinach, shrimp, it has to be good, and caviar on top would make it a special treat. @Sense of Home KitchenHi Brenda, I'm thinking maybe a few cupcake papers together might solve the problem I had. The one we had at the restaurant was in a heavy, cardstock type form.